Not yet travelling (or how we covered the UK in 2 weeks) | Blog the world!!! 10 months is a long time to be away from friends and family so we decided to drive the entire length of the UK and back again to visit all our loved ones before we leave. I say visit. It’s turned into something of a game… How many people could we ‘collect’. We packed the first of the boxes into our old Toyota Celica (bought in 2011 for £450 off a chav in a car park), put air in our partially punctured tyres and set off to the south west. I’m from Clevedon, a little seaside town near Bristol. 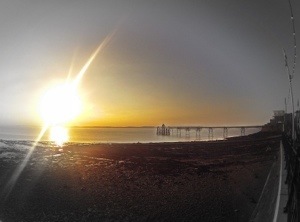 Despite the fact that Clevedon peir keeps falling down and being rebuilt using the same structure, I love it. I like that the only thing worthy of being on a Clevedon postcard is a misshapen tree, and I still get excited at the sight of a small circular train track which can be seen in its entirety from any other part of the same track. Clevedon provided us with a motionless trip on my dads new boat, a night out in Bristol with our friends Jake and Bethan, a meal with my mum and her partner John and a few days at my nan and grandads, and occasionally my dads wife Paula popped up! From Clevedon we explored further south to Cornwall to add my other nan, my auntie and uncle, my cousin and her daughter to the list. That’s only 282 miles and we’d already collected 13 people. Not bad. “Your wheel sounds like it’s going to fall off”. Hmmm. That’s ok. Only another 1,578 miles to go. A few drinks in London allowed us to collect another 7 people and then on to Gemma’s beautiful home town of Whitby (that sounded sarcastic, but it really is very pretty). It is a FACT that Dracula is buried in Whitby. Sadly the name on his grave is spelt incorrectly and he is a fictitious character in a book… But he is buried there. You can ask any whitonian – they’ll tell you. Whitby provided us with a birthday meal with Gemma’s mam (which aparantly means mum up there) and a fair few cups of tea with her dad. A short trip to Middlesbrough also allowed a couple of nights with Gemma’s sister Gaye, and her husband Richard, who must’ve known a long time ago that Gemma and I would be collecting people as they’ve kindly spent the last 12 years creating three more, Callum, Ella and Ethan. A 7 hour drive from Whitby left us in the north of Scotland to tick off our two hardest ‘collections’, our friends Luke and Nat. Nat wasn’t in. So that was a 726 mile round trip to collect one person. Not quite the numbers we’d amassed previously but worth it. From north of Aberdeen down to Edinburgh for a lovely evening with our friends Jo and James and then on to Sheffield to visit Gemma’s other sister Debbie and her fiancé Hep, who, rather selfishly haven’t had any children for adding to our collection. An awesome weekend in both Edinburgh and Sheffield involving wildlife parks, pizza and curry later and here we are back in London. Heathrow to be precise. So that’s 33 people collected. Add to that the 3 friends we had lunch with today and the 6 we went for drinks with. And I’m going to include our previous weekend stint up to Nottingham to see our friend Pavey and his far superior girlfriend, Shell. So that’s 44! 44 people in 2,144 miles. And the car survived. I consider that a win. If you get the chance to meet any of these people by the way, you should. They’re all awesome. Anyway, we’re about to get on a plane as, after our 2,144 miles, we’re about to start travelling… Namaste! Very impressed with the collection, if ever so slightly miffed I didn’t catch you guys in Colchester!! I have quit SHL – and will be leaving on 26 October – wooooo! Added your blog to my rss reader and will be following your adventures with less jealousy now I’m also escaping the city!! Lol – have a fabulous time!